We usually see a handful of samples every year with this disease. 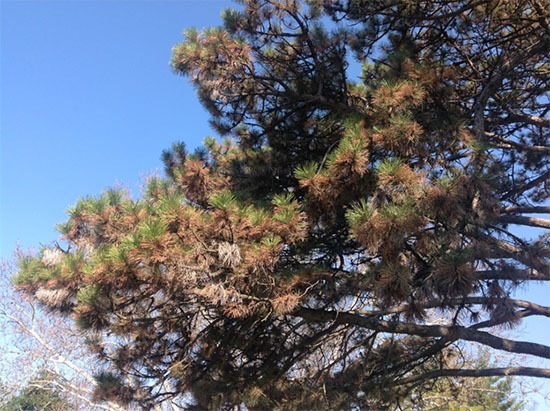 Diplodia tip blight is more common, while Lophodermium nWe usually see a large number of pine, spruce and other conifer samples at the Plant Clinic in spring. 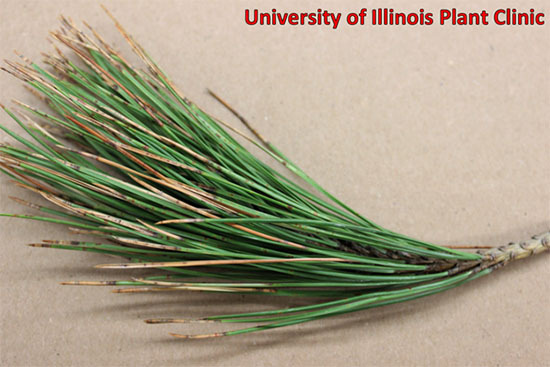 This year we've already diagnosed a few samples of Austrian pine with Dothistroma needle blight. 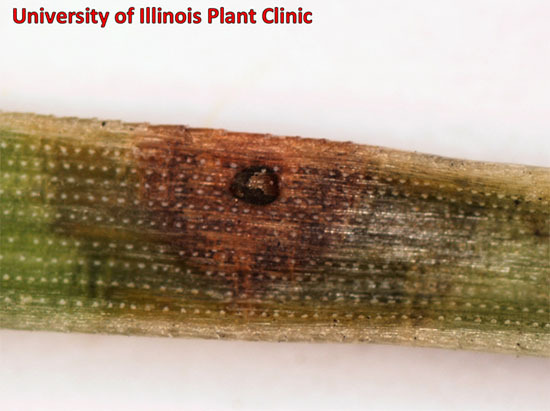 This is a fairly common fungal needle blight pathogen affecting Austrian, ponderosa, Mugo, red, and Scots pine.eedle cast is less frequently seen at the Plant Clinic. Dothistroma causes banding and dieback of affected needles. The very new growth at the tip of the branch often stays green for several months. Infection typically occurs from May through October, with symptoms developing in autumn and early winter. Symptoms are often not noticed until spring. Small, water-soaked or chlorotic spots develop on older needles, which become yellow to tan, then brown to reddish brown as the season progresses. Often, the spots will expand into bands and girdle the needle, killing the tip end which turns brown while the base remains green. Eventually the entire needle will die, leaving dead, brown needles attached to the branch for a season or two before the needles drop. Greatest needle loss is usually seen in spring and summer. Infection usually begins at the base of the tree and progresses upwards. Fruiting structures develop on affected needle in spring, and occasionally in autumn. Small, black structures will erupt through the epidermis of the needle. These fruiting structures are seen in affected areas of the needles and do not develop on healthy tissue. This disease is frequently mistaken for Diplodia tip blight and Lophodermium need cast. Diplodia affects new growth leaving branches with brown needles at the tips. Lophoderium can be more difficult to distinguish, but the fruiting structures of Lophodermium resemble a football with a slit down the center, or a pair of lips.